A boy named Tim wakes from a ten-year sleep on a moon mining colony. He is a companion android designed to entertain and protect an assigned human child, but he finds himself alone and under attack. 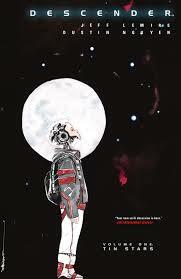 Tin Stars, the first collected volume of the Descender series by Jeff Lemire, begins with shocking galactic catastrophe, but it’s when we meet the earnest young Tim-21 that it truly launches. A grown-up story of both wonder and action, real fears of technology-run-amok are balanced with complex character and heart. In addition to a plot that excites the mind, the gorgeous watercolor illustrations by Dustin Nguyen evoke a nuanced future both beautiful and terrible. The end result is a fully-realized shared vision, one that transports, provokes, and captivates.